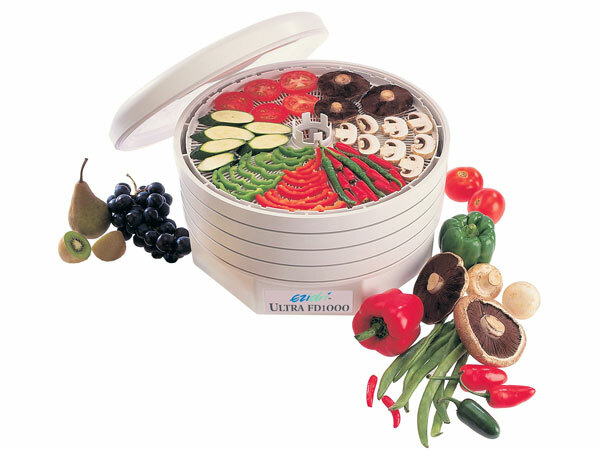 Ezidri Ultra Dehydrator is the most flexible of all Ezidri food driers and is the largest model. Supplied with 5 trays, 1 mesh and 1 solid sheet . It can be expanded to carry a total of 30 trays. Simple to Use - True variable temperature settings from 30 to 63 degrees centigrade. Suitable for Raw Fooders that want the enzymes preserved. Biltong making and excellent as a small commercial unit. Safety - Manufactured to the highest standards with food-safe materials and automatic cut-out. Carrying the international IEC and CE marks of safety certification. Expansion - Supplied with trays (5), plus a mesh sheet and a solid sheet. (Additional trays and sheets can be ordered). Flexibility - A huge selection of produce can be processed, ranging from liquid pastes and purees, sliced fruit and vegetables, small leaved herbs, small fruit slices and solid patties can be accommodated with the selection of surfaces available -trays, solid sheets and mesh sheets. Space Saving - Up to 30 trays and only uses 39 sq cm of counter space. Automatic - Timed Switch-off - The Ultra can be used with a timer enabling you to set the dehydrator to stay on at a selected temperature for a specific time period. Expandability - The Ezidri can expand to more levels than any other domestic dehydrator worldwide. Automatic Timer Facility - Optional automatic timer facilitiy, it has the ability to be left overnight and can be automatically switched off before produce over-dries.